Brewing the perfect cup of java involves a very delicate balance between art and exact science; get one of them slightly wrong and the all-powerful coffee gods will surely smite you. If there is one actor that manages to get this balancing act just right, it has to be OXO. It exemplifies thoughtful design merged with brilliant functionality to create appliances that simply work; work very well. 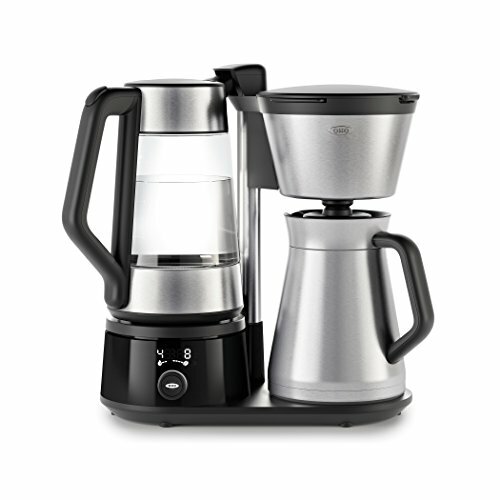 And the OXO Barista Brain 12 Cup Brewing System might just be its best creation yet. So good in fact, that the very choosy Specialty Coffee Association of America (SCAA) have awarded it the elusive Gold Cup Award. Good. Let's see what the fuss is all about with the OXO Barista Brain 12 Cup Brewing System Review! Specific temperature control for coffee and tea. Internal water volume regulator scale. Brews 4-12 cups of coffee. 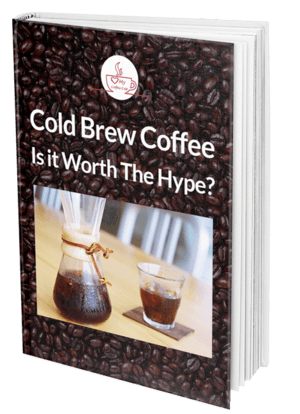 This isn’t your run-of-the-mill drip machine; no siree! It takes the traditional design, completely shreds it, and creates a machine of unbelievable versatility. And boy is it beautiful! 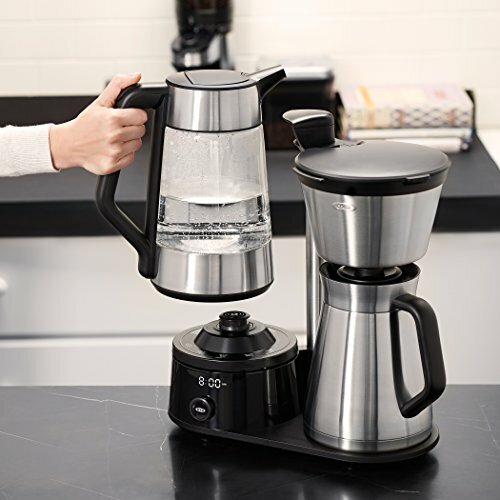 For around $300, you get a borosilicate glass kettle that matches perfectly with the stainless steel carafe and filter basket, culminating in an appliance that your counter top will be proud of. But you better have space to spare, because at 15.9 inches tall and 14.7 inches wide, this beauty has quite the footprint! It works by first heating water in the kettle, and once it has reached the ideal temperature, it’s pumped into the filter basket and sprayed over the grounds in calculated cycles. And the microprocessor that governs these cycles is what makes this drip machine really special. Located in a unit below the kettle, the 'Barista Brian' determines how much water is in the kettle using a scale, then tells you just how many cups of coffee or tea you can make. This OXO machine allows you to heat water to precise temperatures for various types of tea, giving it a versatility that sets it apart. Ability to perfectly heat water for tea. Delay timer makes for brilliant convenience. Easy to use one-dial system. Minimum of only 4 cups. Stainless steel carafe cools relatively fast. The OXO On Barista Brain 12 Cup Coffee Brewing System can be purchased on Amazon for Out of stock. They should change that saying to: The Oxo of all trades. If you happen to be in a household of both coffee and tea drinkers, this machine will be godsend. You can effortlessly program it to brew coffee, while leaving hot water in the kettle for some green tea or your morning bowl of oatmeal. The functionality of the stainless steel carafe is a bit of a letdown though as it only keeps brew nice and hot for about 2 hours. But in thoughtful Oxo fashion, there is a 60-minute countdown timer to let you know just how fresh your joe is. Also, since it has to first heat water before pumping it into the filter basket, you’ll have to wait longer for about 15 minutes to finish a full brew cycle, which is a bit of a drag. But the SCAA knew what they were talking about! 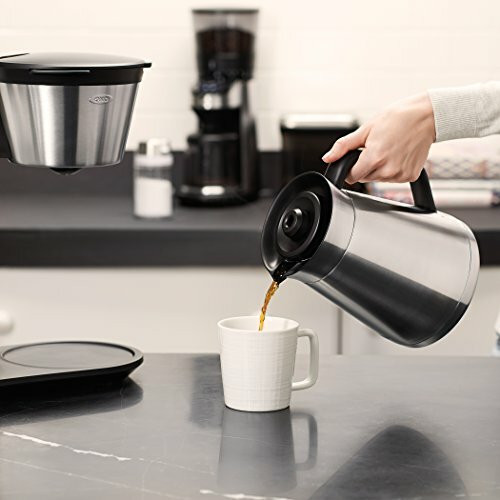 The OXO Barista 12 Cup Brewing System makes coffee so good you’ll want to note it in your autobiography. Coming in at about $300, it is pricier than most other drip machines, but the heavenly results and ease of use make it very good value for money. 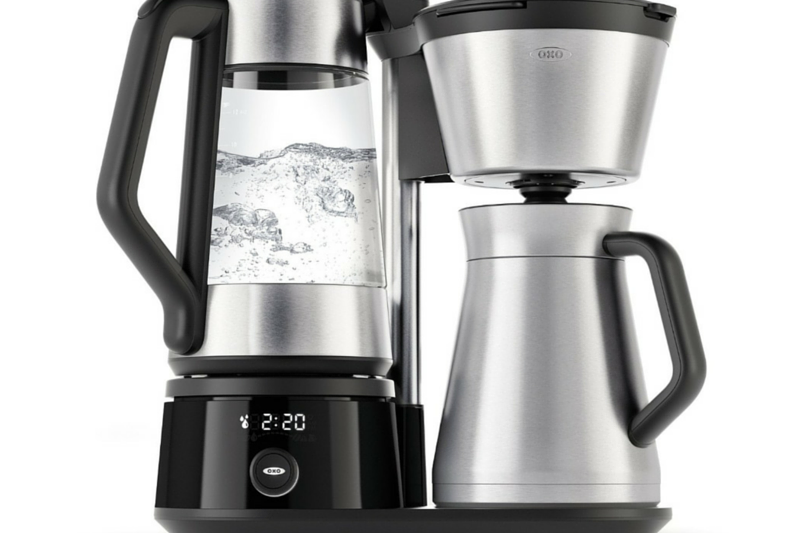 ***We hope you enjoyed reading the OXO Barista Brian 12 Cup Brewing System Review, let us know in the comments below!